Note/Update: The original www.PokerStove.com website has been down since the start of 2013. It appears as though the domain has expired. Shame. https://github.com/andrewprock/pokerstove - Not sure how this works to be honest, but thought I'd link to it anyway. PokerStove is awesome. Any poker player that's even the slightest bit interested in improving their game has a copy of PokerStove on their computer. It's a gem of a program and it's totally free with no strings attached. PokerStove is an equity calculator. In simpler terms, PokerStove works out what percentage chance your hand has of winning against another hand or a range of different hands. Simple example of what PokerStove does. Let's say you have AA before the flop and your opponent has KK. If your opponent pushes all in, what's your percentage chance of winning the hand (that's your "equity" to be more precise) if you call? We can put these hands in to PokerStove and it will tell us the equity of both AA and KK before the flop. Equity of AA vs. KK before the flop. As you might have guessed, AA has more equity with 82% compared to KK's mere 18% equity. AA will win the pot 82% of the time, or roughly 8 times out of 10. Ranges - this is awesome. 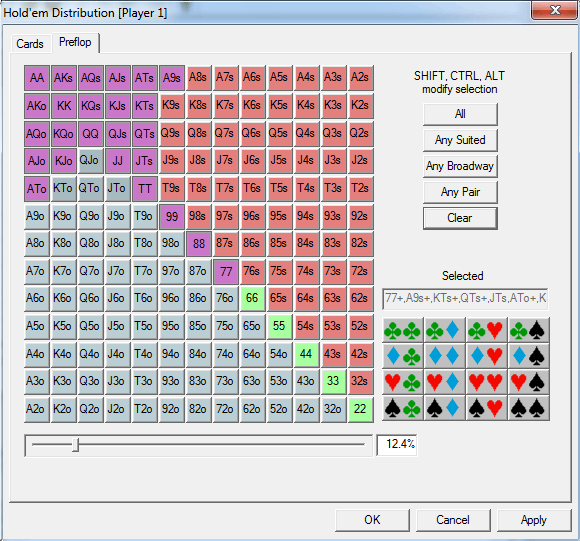 One of the most useful aspects of the PokerStove software is that it allows you to input ranges of hands and not just one specific hand versus another. So instead of having; AA vs. KK, you could have; AA vs. KK, QQ, JJ; or AA vs. any top pair and flush draw. You can input whatever you like. You'll see this in the next example, but you're better off fiddling with the tool for yourself so that you can see how powerful this equity calculator can be. Example of how you can input ranges in to the equity calculations with PokerStove. Bottom line is: don't just use PokerStove for 1 hand vs. 1 hand situations. Get used to using ranges (because they're awesome). Almost every decision you make in poker revolves around your equity at a certain point in a hand. If you can work out how much equity you have, you will be able to work out which plays are the most profitable in any given situation. Finding your equity in the hand is the second step of the Range, Equity, Maximize process. For example, if you have 90% equity (or 90% chance of winning) a hand, it would be foolish to fold to any size bet. If you're winning the hand 90% of the time, you want to get as much money in to the pot as possible. That's just common sense, so here's a slightly more practical example of where an equity calculator like PokerStove will come in useful. Simple example of how you can use PokerStove. If your opponent bets $5 in to a $10 pot, you have 3 to 1 pot odds, which means that you need a 25% or greater chance of winning the hand to make a profitable call (see the ratio to percentage odds chart for more details). Equity of flush draw vs. pair hands on the turn. A slightly more complex example. We can see that we should call with our flush draw against a range of hands that include a pair of Aces or Jacks in this situation. We could be doing this during the hand or in a post-session analysis, but either way PokerStove helps us to figure out whether or not we are making profitable decisions according to our equity. As you can see from the quick examples above, PokerStove can be really quite powerful if you know how to use it well. In fairness you can probably learn a lot by just playing with it, but here are a few PokerStove tutorials to get you started. If you find any other genuinely awesome PokerStove tutorials, contact me and I'll link to them from here. PokerStove for Mac and PokerStove for Linux. Unfortunately there isn't a Mac PokerStove or a Linux PokerStove. However, there are ways to get PokerStove working on Mac and Linux operating systems. Bootcamp. This is a free utility that comes with modern Mac computers. It allows you to run Windows on your Mac, which means that you will then be able to run PokerStove. Parallels Desktop. This is a great program that allows you to run Windows within your Mac OS without having to restart your computer. This is the best option in my opinion, but you have to pay for the Parallels software. Tip: Or you could save yourself the hassle and buy PokerCruncher instead. Getting PokerStove to run on Linux is tricky. The only method that I'm aware of that will allow you to run PokerStove on Linux is through WINE. WINE basically allows you to run Windows programs on Linux, which means that in theory you should be able to run PokerStove on Linux using that. As you may already be aware, WINE can also be used for running poker rooms on Ubuntu. However, I have tried running PokerStove on Linux using WINE but I didn't have much luck. I'm not amazingly tech-savvy though so you may have better luck if you're more familiar with Linux than I am (which most people are). Good luck with it anyway. There isn't currently a PokerStove Omaha or PLO Omaha version out there at the moment, and I don't believe that there are any currently in the works. You'll just have to make do with the Texas Hold'em PokerStove for now. However, there are a few online tools that will calculate hand equity in Omaha. 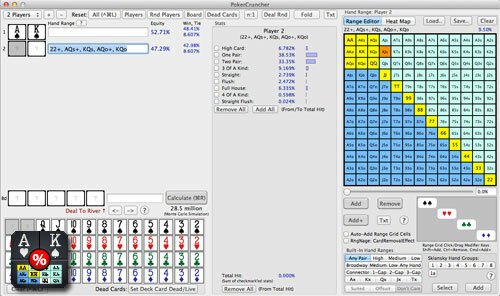 The most popular one is the Poker Simulations calculator at ProPokerTools.com. That's as good as you're going to get if you're looking for an Omaha PokerStove tool. Honestly, there is no need to look for or use any other PokerStove alternatives if you're just after an equity calculator. Many of the web based tools do not come close to the functionality that PokerStove provides, so there's really no need to look elsewhere. Sometimes it's better to keep it clean and simple. Nonetheless, here are some other PokerStove alternatives. These are similar to PokerStove, but more complex with added features. Kind of like PokerStove on steroids. Not all are free though. PokerStrategy.com Equilab (free) - Highly rated alternative to PokerStove. More features. 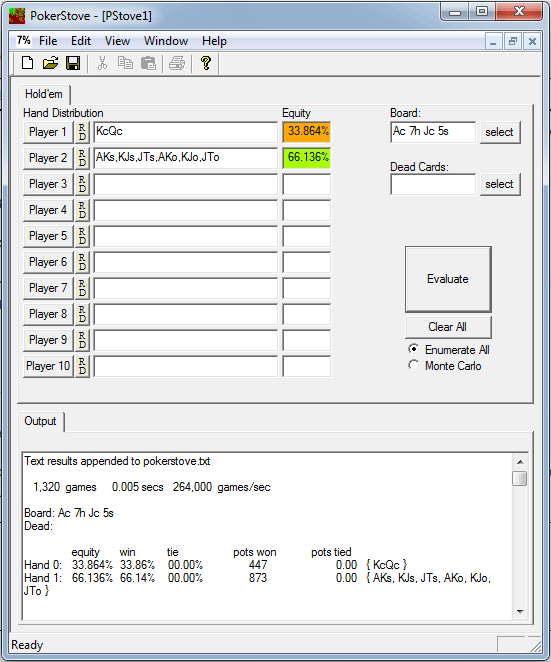 PokerProTools Odds Oracle - Advanced equity calculator and more. Stox EV (free) - It's more advanced and works a little differently to PokerStove, but it's worth a look after you've got to grips with the 'Stove. There isn't an official "PokerStove App", but there is lovely alternative called PokerCruncher. There are a few equity calculator apps out there, but this one is my favourite. It is just simple, effective and looks good. It has iPhone and iPad versions too, but I stick with the Mac version as I prefer Poker Odds Calculator Pro on my iPhone. Want more free tools? Check out SPOC, Fergulator, CHIMP and hoRatio.